Climate Change, Migration, and Conflict in South Asia, a collection of regional profiles and their implications for U.S. foreign policy by Arpita Bhattacharyya and Michael Werz, examines the sub-continent’s vulnerability to climate change in detail. This is CAP’s third report in a series on the link between climate change, migration, and security. Others introduced the climate-migration-conflict connection and focused on North Africa and South America. The Center strongly advocates for a non-traditional approach to national and international security, reasoning that when the second-order effects of climate change are considered, the changes are not solely a threat to island nations or coastal regions but to a safe and equitable international environment everywhere. The Indian state of Assam is given as a prime example of an area that has much to gain from a more comprehensive approach to national security. Assam is part of a region of Northeast India known as the “Seven Sister States,” contiguous states that share at least one border with another nation and have correspondingly diverse cultures and ethnicities. The whole region is connected to the rest of the country via the Siliguri Corridor between Nepal and Bangladesh, less than 25 miles wide at its narrowest point. 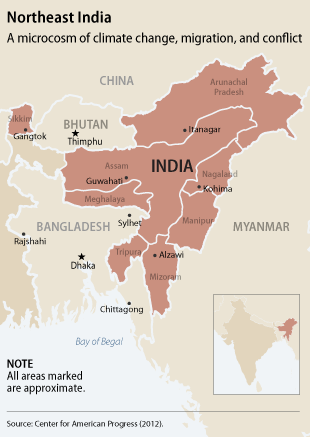 Otherwise, Assam wraps around Meghalaya state and touches the borders of Bangladesh, Bhutan, and the disputed border state of Arunachal Pradesh. Unlike Bangladesh – perhaps the most frequently cited South Asian country when it comes to climate change vulnerability – Assam is not directly at risk from rising sea levels. However, it does feel the indirect effects of changes in its neighbor. Climate changes in Bangladesh, with its low-lying geography, dense population, and large subsistence agriculture base, create push factors for migration into Assam. The flow of international migrants between the two is arguably the largest in the world, with the Mexico-to-United States connection coming in second, according to the Asian Development Bank. Lisa Friedman of ClimateWire remarked in a recent Friday Podcast that the reasons for such high numbers of Bangladeshi migrants are complex, but two of the largest are saline intrusion into rice fields, which has shifted the agricultural market to shrimp farming, a harder livelihood for farmers, and the attraction of construction jobs in India. Assam faces more direct effects of climate change as well. In September of last year, more than 1.4 million people were displaced by flooding along the Brahmaputra River in 18 of 27 districts of Assam, and 6 million were displaced in July. Unfortunately, “the frequency and extent of these floods is set to increase,” write the authors. Changing rainfall patterns also mean more erosion, creating the risk of deadly landslides like those that struck Western India earlier this summer, and unexpected droughts. An additional population dynamic at work in Assam is urbanization. Rapid, unplanned urbanization puts pressure on water and other resources. This rural-to-urban movement can be temporary or permanent, depending on the severity of push factors, further complicating Assam’s ability to plan for infrastructure challenges. In addition to shifting patterns of human settlement and flooding, Assam has a complex history of internal tensions between competing religious and ethnic groups. Clashing between the Bodo tribe and Muslim Bangladeshi immigrants are among one of the most violent of these tensions. The Bodo are an indigenous tribe in Western Assam, making up about five percent of the state’s total population. After waging an insurgency against the government for years, they were granted limited autonomy over about 3,000 villages in 2003. But in recent years, they have repeatedly clashed with Muslim immigrants over land rights. The worst fighting took place last summer when approximately 100 people were killed and over 400,000 displaced due to raids and violent reprisals by both sides, reports CAP. The perception of conflict between Muslims and non-Muslims has wielded as much destructive force as the conflict itself. Rumored but unconfirmed attacks by Bengalis intensified the anti-immigration sentiments of the Bodo and other indigenous groups. A press conference was even held by groups claiming to represent Assam’s indigenous peoples demanding that “unauthorized foreigners be put in detention camps or under house arrest,” write Bhattacharyya and Werz. Further, the violence in Assam last year affected the entire country, as thousands of people native to the region boarded buses to return and support indigenous protests and demonstrations. Climate change stressors, CAP argues, have trickle down effects that contribute to underlying tensions and may eventually interrupt social, political, and economic rhythms. For a place like Assam, where stability is already threatened by conflict and mass movements of people, the threat is doubled. Assam’s combination of religions and ethnicities, variety of migration patterns, armed conflict, and vulnerability to climate changes is a microcosm of the modern challenges facing India, write Bhattacharyya and Werz. The biggest change needed, CAP warns, is for governments in the region to become more responsive – to both the needs of their citizens and changes in the natural and built environment. Besides the effects of climate change, it is imperative that governments in South Asia “account for the impact of development, increased urbanization, and rising demand for services,” writes CAP. To head off deterrent policymaking and government complacency, Bhattacharyya and Werz recommend establishing universal principles, such as humanitarian rights for immigrants displaced by climate change and the inclusion of urbanization as part of the solution towards sustainability. Sufficient attention must also be given to rural areas though, including improving food security, delivery of energy, and development of infrastructure. In terms of applicability to U.S. foreign policy, they suggest the United States can be “a vital partner” in the effort to prepare and cope with changes across South Asia. They recommend the United States help set-up high-level climate vulnerable cities workshops, facilitate cross-country dialogue on migration, and promote “ecological infrastructure development,” to minimize the destruction caused by flooding, erosion, and salinization. As Assam shows, climate change challenges the conventional definition of national security, but if policymaking – which CAP calls on to be “nuanced, based on sound research, and free from political hyperbole” – is responsive, it is also an opportunity to think more broadly, to take more than just soldiers and weapons into account for defense, and to create sustainable and lasting peace. Ashley Ziegler is a cadet at the United States Military Academy at West Point and an intern with the Wilson Center’s Environmental Change and Security Program. Image Credits: Center for American Progress.